Dental Disease in pets - it is real! Dental Disease in pets – it is real! As a notorious lover and collector of small breed flat face dogs with under bites myself, I can most definitely vouch for this through personal experience with my own fur family! An often overlooked fact; as your pet’s veterinarian, we are their dentists too! One of the most important parts of your pet’s annual exam is examining their mouths and evaluating their oral health. 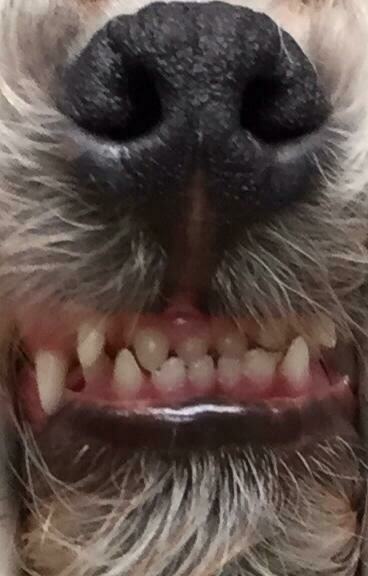 We look for tartar, calculus, gingivitis, broken teeth, missing teeth, root exposure, loose teeth, infection and masses. One can only imagine what would be found in anyone’s mouth who does not brush, floss and visit their dentist regularly! Dental disease is very common in dogs and cats, and cannot be ignored! Tartar and calculus (hardened mineralized tartar) is a common finding. 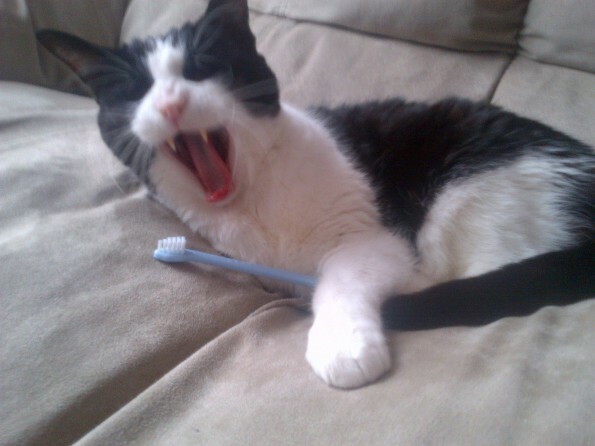 If caught early, a proper dental cleaning can remove this and restore our pet’s oral health. If left to fester, gingivitis will progress and the gums and bone will start to regress causing painful root exposure. Once the roots are exposed, unfortunately a cleaning is no longer enough. This is end stage dental disease and very painful for our pets. These teeth now must be extracted as the only treatment option for these patients who have undoubtedly suffered trough this process of disease and decay. Dental fractures are very common as well, and is often the most common reason for extraction of the large chewing premolar in dogs. Pet stores are filled with many chewing options for dogs; some of which are excellent choices. Others are very dangerous and can lead to serious and very painful fractures of the teeth. Hard chews such as natural bones, antlers, dried cow hooves, hard pressed rawhyde and nylon bones are common culprits here. These teeth are most certainly painful and require either extraction or root canal treatment. Tennis balls can be quite damaging as well. The nylon fuzz is abrasive and can cause significant wearing of the teeth. If the wearing is severe enough, it can cause nerve exposure and pain, requiring extracting or endodontic treatment. The good news here? There are many preventative measures we can take as pet owners to help maintain orally health and comfort in our pets! 1) Dental diets: Diets carrying the VOHC (Veterinary Oral Healthcare Committee – a group of board certified veterinary dental specialists who review dental products) seal (ex Royal Canin Dental Diet or Hills t/d), have been clinically proven to move plaque and tartar from teeth. They are fully balanced , high quality diets suitable for healthy adult pets. They are most effective if used as the primary diet for your pets. 2) Daily brushing: Daily brushing with an infant toothbrush or finger brush along with a pet friendly tooth paste can also help to decrease tartar and plaque accumulation on teeth. Softer Chews such as flat rawhyde chews such as CET chews are safe chewing options that are enjoyable for pets and can aid in maintaining oral health. They start firm, but become soft as your pet chews them, thus making tooth fracture very unlikely. Although the above home care options are excellent and helpful, your pet will still require a proper dental cleanings by their veterinarian. You can compare this to us humans having to see our dentist regular once or twice a year despite practicing proper brushing and flossing at home. We use the same equipment that human dentists use. They are sharp, vibrate and make noise. Our cats and dogs would not stay still for such a procedure, making a proper cleaning impossible and dangerous. For this reason, the standard of care requires us to preform these procedures under general anesthesia. This allows us to completely examine your pets’ mouth and clean under the gumline. Full mouth x rays of the teeth are a must as well. Most dental disease begins under the gumline. Our patients cannot alert us of a sensitive tooth. It is not uncommon to find otherwise undetectable infection, bone loss, fracture or uninterrupted teeth on x rays. All these are painful and lead to infection or even jaw fracture if left undetected or untreated, thus making this a very important part of the dental procedure. Small dogs (esp the flat faced dogs such as pugs and shih tzus) and cats commonly have significant disease picked up dental x ray that would have otherwise been unnoticed leaving them to suffer in silence. Together with you, we are your pet’s health care team! If you are interested in learning more about homecare options for your pet or if your pet can benefit from a dental cleaning, please contact one of the members of our healthcare team! Your pet will live a longer life free of oral discomfort and pain and will most certainly thank your for it!! February is Oral Health Awarness Month! Win a Dental Basket full of dental goodies and a large bag of food! – For every bag of Royal Canin Dental Formula or Hills T/d you purchase you get a ballot into the draw. – For every dental procedure booked in the month of February and march you get 2 ballots into the draw! Royal Canin Dental Formula Loyalty Program: From February 1st to March 31st you can enroll in the Dental Loyalty Program! – Purchase 5 bags of Royal Canin Dental and get your 6th bag FREE! – Would you like to try a bag of Dental Formula? Come by the clinic and pick up a complimentary trial size of Royal Canin Dental. Just the right size to see how much your pet will enjoy this great food! – For the month of February we have decreased our minimum order from $100 to $75 for free home delivery! This is a great opportunity to give our webstore a try! To register, click on the Webstore link on the main page of our website. Come check out the clinic for all of these great Oral Heath Awareness offers today!